YAY! It's contest time. This month I will be giving away the highly anticipated book, MOCKINGJAY! I personally have been looking forward to this novel since before Catching Fire even came out. Note: your email address will not be used for any purpose than to contact you if you win, and will not be shared. Winner will be posted on the blog by August 3rd, winner will be emailed and have 1 week to respond. I'm from Good Reads--thanks for the giveaway!! I was sent from Goodreads-great giveaway! Hope to win this one. Ive been waiting for this book forever! thanks for the giveaway! this is definitely the one book that i have been waiting the most this year to come out. 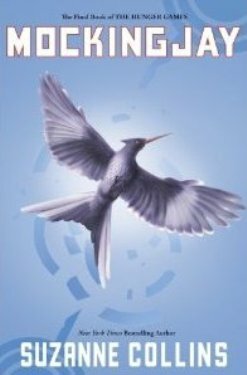 I just read Hunger games last week and loved it. I ordered Catching Fire and now am waiting for it to arrive in the mail. I'm so excited for Mockingjay. Thanks for the great giveaway! Thanks for the wonderful giveaway. Hope to read this when it comes out! I am so thrilled about this giveaway. Thanks a bunch.